OK, so the first impression may be the most lasting, but the last impression is pretty important, too. If you’ve been reading my series of stories on my stay at Four Seasons Resort Maui at Wailea, you know that Four Seasons Maui made a grand first impression on me. You also know that the resort would have to do something that deeply offended me for me to leave with a sour taste in my mouth (in a literal sense, I suppose bad food would do that, too). Of course, that didn’t happen. My last two days at Four Seasons Maui left an even bigger smile on my face, and the experience gave me a better grasp on what distinguishes the premier resorts from the ones that are simply trying to keep up. And it’s not all about having a lot of money as a luxury resort. Hotels all over the world could learn from the little touches Four Seasons Maui implements throughout a guest’s stay. For example, beyond the variety of complimentary activities and services Four Seasons Maui offers, it also holds a complimentary one-hour “Aloha Reception” every week (usually every Wednesday) where guests can meet the people behind the scenes, like Dr. Mark Emerson (who specializes in chiropractic care and also advises on health and wellness) and Dan Myers, the resort’s assistant director of food and beverage. 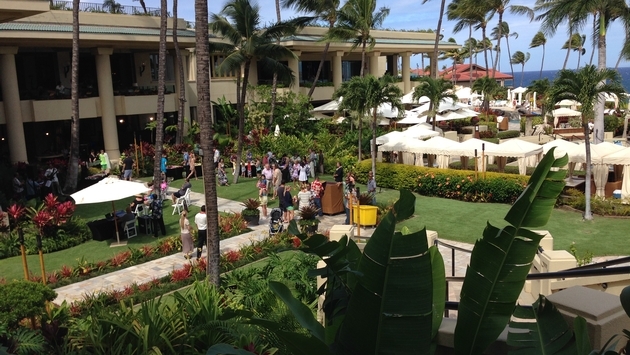 On my third day at the resort, Four Seasons Maui’s Aloha Reception focused on health and wellness. The reception included a cooking demonstration of Island Vegetable and Tofu Ceviche by one of the employees, Michael Meier, as well as a juice and smoothie stand boasting some delicious concoctions courtesy of Dr. Emerson, including “Green Power,” which includes banana, spinach and almond milk. Myers recently transferred to Four Seasons Maui from Four Seasons Hotel Westlake Village in Los Angeles, so he knows a thing or two about health and wellness (Four Seasons Westlake Village’s on-site California Health & Longevity Institute is world-renowned). Myers told me that Four Seasons Maui began really focusing on health and wellness about a year ago due to guest demand. The breakfast buffet at DUO Steak and Seafood, which includes a smoothie bar featuring Dr. Emerson’s creations, has been a hit. After the reception, I had the pleasure of dining at Ferraro’s Bar e Ristorante, which tied for “Best Italian” in the 2014 ‘Aipono Awards (chosen by readers of Maui No Ka ‘Oi magazine). First of all, the view from the open-air dining area is fantastic. During your candlelit dinner, you are overlooking Wailea Beach and the breathtaking ocean. This would be a very romantic spot to bring a hot date. I also found it rather amusing (and rather clever) that Four Seasons Maui set me up at 6:30 p.m., right around sunset. I was able to meet Ferraro’s manager, Alec van Meijeren, right away, who promptly offered me champagne. I also met one of the chefs and my waitress was very pleasant. They all were very interesting to talk with and engaging throughout the course of my meal. I started my meal off with dry salami, cheese and bread with extra virgin olive oil from the Maui Olive Company. I then had the Polenta Fried Calamari with calamari, shrimp, sweet cherry pepper, arugula and lime aioli. I finished off my meal with Orecchiette Crema Rosa pasta with chicken, sun-dried tomato and tarragon (along the way, I may have had a couple of blueberry-infused mojitos as well). As if that wasn’t enough, Ferraro’s sent me home with tiramisu and a couple of coconut treats. While I’m no food critic by any means, I do have a bit of Italian blood in me and I grew up tasting a variety of Italian dishes. Safe to say, Ferraro’s satisfied the Italian in me. Note: While I’m well aware that staff members may try to impress me a bit more than the average guest given the fact that I’m doing a feature on the resort, I never got the sense that my interactions with any of the staff at Four Seasons Maui were inauthentic or forced. As Christine, my massage therapist on Day 1, said, you won’t last very long at Four Seasons Maui if you don’t truly care about guests. After I noticed Jimmy Watt, general manager of DUO, interact with one of the kids during my dinner on Day 1, I noticed Meijeren regularly stopping by guests’ tables to check on them. 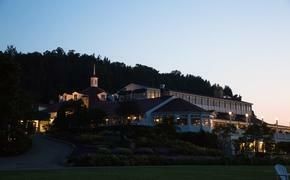 You don’t become an acclaimed five-star resort—or award-winning restaurant—by simply going through the motions. 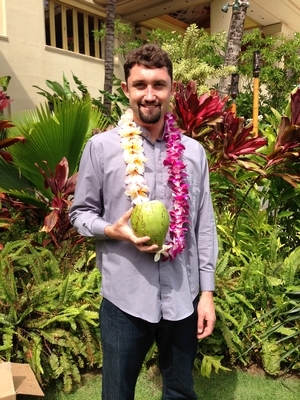 May Day, or Lei Day, was a fitting ending to my business trip/vacation at Four Seasons Maui. Lei Day celebrates Hawaiian culture and the start of the beautiful month of May. 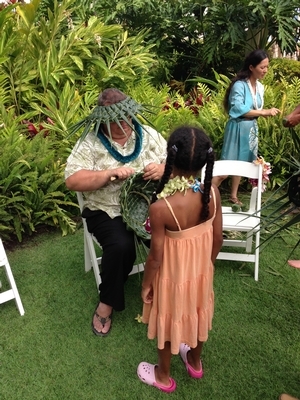 During Four Seasons Maui’s reception, guests were able to make their own leis, be fitted with bracelets and hats made out of plants and palm fronds, and drink straight from coconuts chopped up by resort staff as staff members danced and played live music. PHOTO: The Santa Claus of palm frond hats. This guy was awesome. I made my first lei, and what a beauty it was! Kevin Gavagan, Four Seasons Maui’s assistant director of grounds and landscaping who gave me a cultural garden tour of the resort, was there…of course. The man is everywhere. He played guitar and sang. Heck, several Hawaiian men even performed a Haka, a traditional ancestral dance originally performed by warriors that now serves as an official welcoming ritual. I felt a little bad for one staff member, who was in sole charge of cutting up the coconuts with a machete. He was a big guy, but I don't think Four Seasons Maui realized how many guests would want a taste. Not only did practically every kid walk up for a coconut (they were also fascinated by the process of cutting it open), but practically every adult wanted one, too. That man deserves a raise! In line with Four Seasons Maui’s commitment to local products, there were also local art and crafts spread out throughout the resort during Lei Day. Guests could even watch one artist while she painted. In conclusion, Four Seasons Maui lived up to its billing as one of the world’s top resorts, as well as the distinction of being named as one of the top 25 luxury hotels in the United States in TripAdvisor’s 2014 Travelers’ Choice Awards. And it didn’t hurt that I got a ride back to the airport in a Tesla, either. “A hui hou,” Four Seasons Maui. It’s been a pleasure.